Parlé Magazine: First things first man, what’s up? What are you up to right now? Jay Mel: I am heading up to Pittsburgh. Got a show for one of my boys who did a lot of promotion out in Pittsburgh, so I’m heading out there tonight. Making new music, doing shows, doing shows. I’m from Youngstown Ohio, so I’m pretty glad to be over here. Trying to make it … making music. Parlé: I haven’t gotten a chance to listen to you yet because my internet is all fucked up. But that gives us an interesting opportunity: can you tell me what you think I’m going to hear–or what you want me to hear–when I can finally listen to your stuff? Jay Mel: Well the new stuff … I mean, really, with all the music, it’s all something different. I go from Hip-Hop to Pop music, and it’s really just what mood I’m in–writing the music–to decide what I’m going to do with each song. What you’re going to hear is mostly lyrics. I started out battle rapping, so that has always just kind of been by my side. But the Hip-Hop base is what it all revolves around, and it just kind of branches off from there. But you know, there’s fun stuff, serious stuff, depending on what mood I’m in when I’m writing music. Parlé: Alright. You said you’re from Youngstown, I’m actually from Columbus. Can you just tell me a little bit about Ohio? Does being from a place like Youngstown influence the music? Jay Mel: Are you asking does Youngstown influence music? Like, does Youngstown have its own style? Is that what you’re asking? Parlé: Yeah, yeah. Like do you guys sort of have your own style there? Jay Mel: Mmm no. By no means. Most of all, it’s tough in this area, and you even talk to like DJs–my own DJ, he was spinning the new Chris Brown song the other night, and people stopped dancing when it came on. But it’s going to be a hit. So it’s tough for a lot of artists to do their own thing. So for the most part, everything sort of sounds like a mixture of what someone else is doing. Follow me? Jay Mel: I definitely pay attention to what other artists are doing, because if they’re making it they’re obviously doing something right in some way. Not that I’m trying to choose a style and bite off a style that they might be using, but I am paying attention because they’re making noise and getting signed. You know, moving further then what I’m at right now. Stalley, he’s doing his thing. Kid Cudi, I heard that he did something with like rock music now? Parlé: Yeah, with Dot Da Genius. Jay Mel: I didn’t get to hear anything, I was just reading that last night. Parlé: It’s pretty out there. Jay Mel: People like Machine Gun Kelly, from Cleveland, there’s definitely people doing stuff in Ohio that is getting noticed. Parlé: Definitely. When you released the track “Live It Up”, you launched a “Live It Up” campaign, it’s been about a month into this thing. How’s that going? What have you been doing that made it more of a campaign then just a simple single release? Parlé: They said you were going to perform like at a 5k in Pittsburgh? I’ve never heard of something like that. Tell me about that, man. That sounded like a cool idea. Jay Mel: One of my guys out in Pittsburgh, he puts on benefits for whatever situation it is. So there was an autism benefit, he did a 5k for it. I’m always down to support less fortunate people by any means possible. So he asked if I wanted to do it, and I was like yeah, let’s go out. People ran, they raised $7500 for it, I performed, and it was a good time. Parlé: How did people react to that kind of thing? Did you get a good response from it? 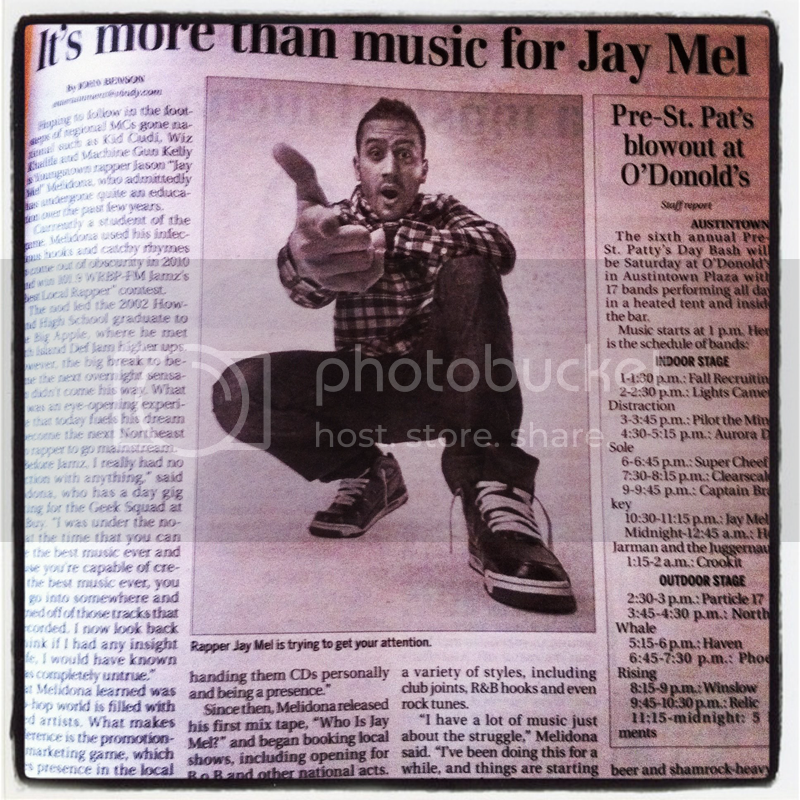 Jay Mel: Yeah, I was actually kind of nervous, because it wasn’t really like, obviously, a Hip-Hop crowd. But a lot of people knew who I was, and they loved it. So I was … I definitely walked out of there a lot happier then what I thought I was going to be responded to. The kids liked it, and the parents thought it was really cool that’d I’d come out. Parlé: That’s pretty cool, man. You thinking about, sort of, cornering the fun run market or something? That could be lucrative. Jay Mel: [Laughs] Like I said man … I really reach out to people that don’t have it as good as what I do, or what a lot of other people do. Seeing kids that can’t live a normal life, or kids whose parents weren’t there in their lives–I just got a heart for that. Parlé: What kind of things influence your music? I mean, do you have guys that you used to listen to growing up, is it just sort of in you? Where does the creative process come from for you? Jay Mel: Growing up, the first thing that got me started off making music was I would go buy singles at the local record store, and they would have the track with the instrumental. And I’d write raps over it, or rap the lyrics, and the first song was “Mo’ Money, Mo’ Problems.” That was like the first song that kind of got me like, I want to do this. But I go from that to James Taylor, to Tupac; it’s all over. I like T.I., it’s all across the board. I’m definitely not just based on Rap music. I listen to other stuff. And I played drums for 15 years. Parlé: Awesome. Did you like drum for a band or something? Jay Mel: No, I actually grew up drumming for my church. And then I quit drumming, and then I just kind of did my own thing. I’m actually looking to do a drum over one of my songs here in the studio, throw people off a bit. Parlé: Cool, cool. So, seeing as how we’re both from Ohio, I have to ask: Who do you think, besides yourself of course, is the best rapper to ever come out of the buckeye state?  Jay Mel: Ever to come out? That’s a … hmmm … there’s a lot of people that I know personally, that were way crazier of a rapper in being able to put lyrics together then I’ll ever be. It’s the same thing as like, Michael Jordan. He was the greatest of all time, but we all know that theres greater basketball players out there than Michael Jordan. So I can say personally that I know a couple guys that I used to do music with that would eat anybody up on the mic. So, that’s a tough question for me. Parlé: I was going to go with Krayzie Bone, but that’s just me. Jay Mel: Oh yeah, don’t get me wrong! Bone .. I just, on my local radio station, I used to wait for the ‘Hot Eight at Eight’ to come on just so I could hear “Crossroads.” Trust me, they’re definitely one of the all times. I would get my tape cassette ready so when it would come on I could record it on my tape cassette. Parlé: That’s awesome man. What’s next? I know you were talking about heading out to LA, putting a real push on something. What can fans look forward to coming from you in the future? Jay Mel: Really, just this project. I’m really excited because I don’t really have any producers that I work with on like a personal level. I’ve got a couple guys that I do some stuff with, but nothing that like defines who I am with music. So I’m really looking forward to this trip to meet with these producers and be able to create something that can bring everyone together, with this project. I may be shooting more music videos; that’s a big thing for me, videos, which for every rapper is a big thing I guess. Having dope visuals online is a necessity in this day and age. Shoot more videos. I’ve released a track “You Know,” a track “I’m Good,” a track “All I Need” and then “Live It Up.” Those four music videos already. I have one more that’s already been shot that’s releasing mid-March that’s called “Feel My Pain” That’s a serious one. And then I don’t have any more videos shot yet, so on this trip out to LA I’m pretty certain there’s two videos that are planning on being shot out there … but yeah, just new videos and continue to do shows and get this project done. Parlé: Awesome man. Any final words you want to put out there? Jay Mel: No, man. I’m just working, trying like everyone else out here. Live your dream. So, that’s it. 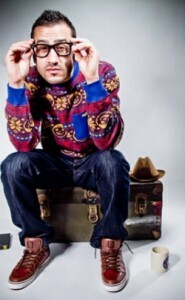 Hoping to follow in the footsteps of regional MCs gone national such as Kid Cudi, Wiz Khalifa and Machine Gun Kelly is Youngstown rapper Jason “Jay Mel” Melidona, who admittedly has undergone quite an education over the past few years. Currently a student of the game, Melidona used his infectious hooks and catchy rhymes to come out of obscurity in 2010 and win 101.9 WRBP-FM Jamz’s “Best Local Rapper” contest. The nod led the 2002 Howland High School graduate to the Big Apple, where he met with Island Def Jam higher ups. However, the big break to become the next overnight sensation didn’t come his way. What did was an eye-opening experience that today fuels his dream to become the next Northeast Ohio rapper to go mainstream. What Melidona learned was the hip-hop world is filled with talented artists. What makes the difference is the promotional and marketing game, which includes presence in the local music scene as well as on the Internet. Since then, Melidona released his first mix tape, “Who Is Jay Mel?” and began booking local shows, including opening for B.o.B and other national acts. While he released singles such as “In and Out,” “You Know,” “All I Need,” “I’m Good,” and his latest, “Live It Up,” the next big project is his debut full-length effort, which is due out this summer. Compared to the likes of Drake and LL Cool J, Melidona said the upcoming CD features a variety of styles, including club joints, R&B hooks and even rock tunes. Melidona’s next hometown show takes place at a pre-St. Patrick’s Day event booked for Saturday at O’Donold’s in Austintown. While playing a green-beer and shamrock-heavy type of gig doesn’t seem hip-hop, Mel said he’s got a surprise. “I got my little kilt on, and I go hard,” Melidona said.